For those of you new to the product, this adapter allows one to use a standard laptop style 17″ LCD screen in the Apple 17″ Intel iMac. This is a solution to the all too common issue of vertical lines developing on the OEM screen. Additionally it allows the installation of a high resolution(1920×1200) LCD screen. 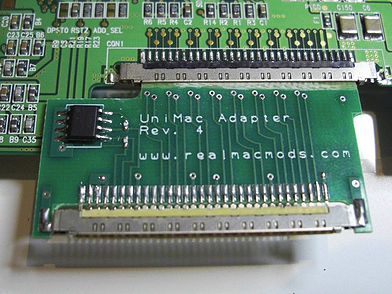 UniMac Adapter Version 4 eliminates several previous components, and increases stability. Size is also reduced dramaticaly, allowing a much more seemless modification than other versions.